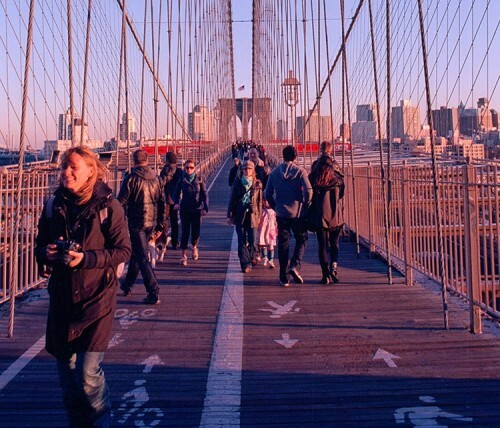 Every day, an average 4,000 pedestrians and 3,100 cyclists cross the upper-level pathway of the Brooklyn Bridge. Commuters, tourists, and joggers vie for space on the congested path, whose width varies from 16 feet to as little as 8 feet—creating a bottleneck for two-way bike traffic. For years observers have recounted harrowing tales of near collisions on the overcrowded span, like the bike-phobic Post pitting reckless cyclists against merely oblivious tourists and the Times calling for the appropriation of a traffic lane for bike use. But now a proposal to double the width of the path could offer a solution to the overcrowding. The answer to this conflict is expansion, according to three City Council members from districts adjacent the Bridge: Margaret Chin representing Lower Manhattan and Brad Lander and Stephen Levin representing the Brooklyn waterfront from Greenpoint through Carroll Gardens. 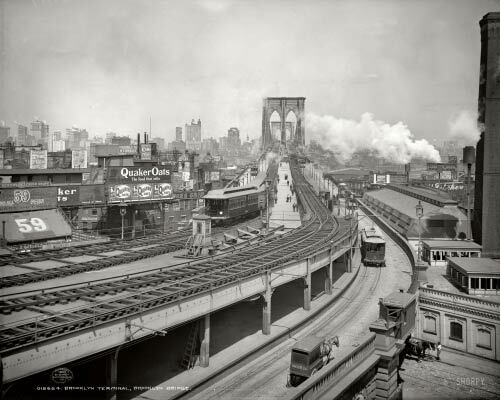 “As the lower Manhattan and Brownstone Brooklyn communities continue to grow, the Brooklyn Bridge is becoming an increasingly vital connection,” council member Chin wrote in a statement. “We must ensure this historic destination is equipped to handle our city’s growing transportation demands.” Currently the pathway widens as it passes around the iconic bridge towers supporting the bridge's suspension cables, extending over the innermost traffic lanes below. The council members propose widening the entire pathway to that width, creating a dedicated bike lane on the northern side and an additional pedestrian lane on the south side, thus tripling pedestrian capacity. The proposal has not yet been discussed with designers or engineers, and council member Levin suggested a design competition to create a more refined plan. No budget or plans for funding have been established and no timeframe has been set for such a project. 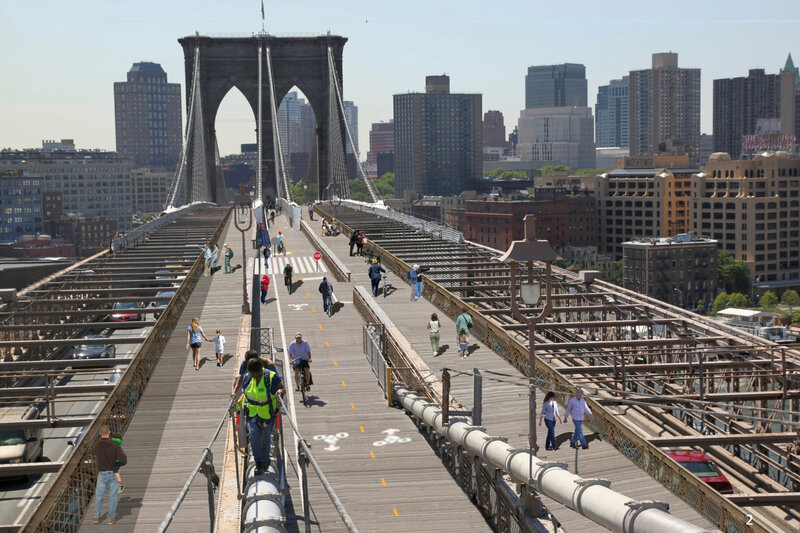 The council members suggest that it could be integrated with current plans for a redesign of the approach at Tillary Street on the Brooklyn side of the bridge, which currently leaves pedestrians and cyclists to pile up in the middle of the road waiting for a crosswalk. Increased capacity will also demand a redesign of the Manhattan approach, as bottlenecking already creates congestion there as well. 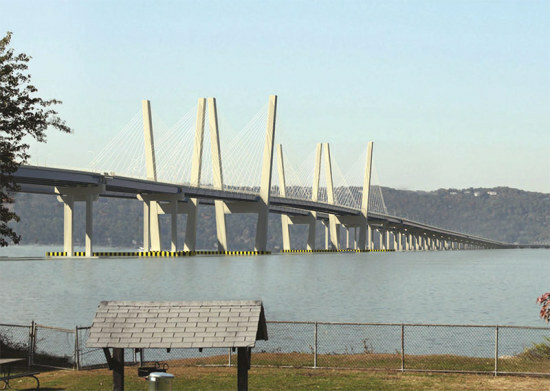 Any alterations to the bridge will require the approval of city preservationists, as the main span is a city-designated landmark, a national historic landmark, and a national historic civil engineering landmark. Modification would not be unprecedented, however, as the original trolley and railways were removed from the bridge in the 1950s. 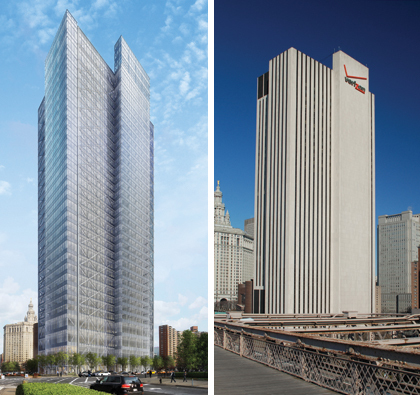 It looks like one of New York's ugliest buildings may also have turned out to be one of its naughtiest. 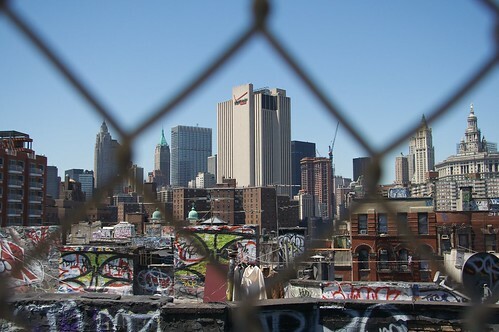 The exchange place at 375 Pearl Street is reviled by many, including tall buildings expert and AN pal Carol Willis, thanks to its blank sides and besmirching of our Brooklyn Bridge panoramas. Fortunately, plans were in the works to have Cook + Fox reclad the building and turn it into something more befitting of an increasingly polished downtown, not unlike the recent transformation of another former phone exchanger across from Bryan Park, 1095 Avenue of the Americas. But that could all come tumbling down thanks to some long—or is it tall—overdue taxes. Curbed sounded the alarm about a report in the Tribeca Trib that details some serious zoning and tax violations stretching back to when the building was first drawn up in 1972. Apparently, when the exchange place—basically floor upon floor of telephone connections—was constructed by New York Telephone, it added hundreds of thousands of square feet more than it promised in its deal with the city, from whom it bought the land for $17 million at the time. Had it not been for the 2007 sale of 29 of the building's 32 floors to Taconic Development, and the developer's subsequent advertisement of the missing square footage, the city might never have realized. But now, they're suing Verizon and the developer—the city alleges Taconic was complicit, given its below-market-rate price for the floors—for $53 million plus interest. And if that were not enough to kill the reclad, there's an injunction on any construction work taking place at the building until the case is resolved.